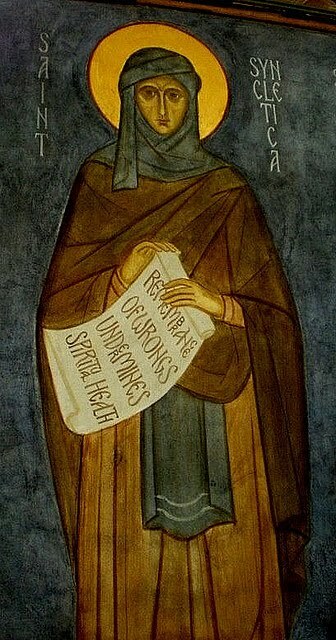 St. Syncletike or Syncletica (Feast Day - January 5). Fresco above by Elder Sophrony Sakharov at the refectory of St John the Baptist Monastery in Essex. Called by God she is joined with the servants in heaven. 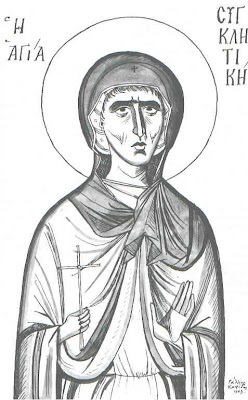 The blessed Syncletike, named after the heavenly assembly [synkletos], was from the land of the Macedonians. Her ancestors, having heard of the love of God and the love of Christ of the Alexandrians, went from Macedonia to lay hold of the city of the Macedonian (Alexandria). When they arrived at the place, they found the circumstances to be better than what they had heard said about the place. It was not that a large number of people pleased them, nor did they marvel at the greatness of the buildings; but finding there a single faith with pure love, they regarded this foreign settlement their second home. And the blessed Syncletike was admired from all sides because of her family; moreover, she was adorned by all the other customary worldly pleasures. And present with her as well was a like-minded sister, and two brothers who were also prepared for the most religious life. One of the brothers, when he was of youthful age, died; the other, having arrived at his twenty-fifth year, was exhorted into marriage by his parents. But when everything was prepared for the desired end, and when the contracts were completed, the young one flew away like a bird from a snare, having exchanged his earthly bride for the perfect and free assembly of the saints. But she still being in paternal protection, for the first time trained her soul toward love for the divine; and thus she performed no cares of the body, as she carefully observed the impulses of her nature. For she was exceedingly beautiful physically as to attract to herself from her first youth many suitors. Some were attracted by her abundant wealth, some by the decorum of her parents; but over and above these things they were attracted to the beauty of the girl herself. And certainly her parents gladly urged the young girl toward marriage, urging this so that through her the succession of their line would be protected. But the wise and noble-spirited woman did not at all arrange things according to these counsels of her parents; hearing worldly marriage, she imagined divine marriage; and overlooking many suitors, she possessed the inclination for the divine Bridegroom alone. The weave of multicolored clothing did not seduce her eye, nor the different colors of precious stones. Cymbals did not deceive her hearing, nor was the flute able to weaken the course of her soul. The tears of her parents did not soften her, nor the exhortation of any other relative. But holding onto her reasoning power adamantly, she did not change her mind; and having closed up all her senses just like a window, she associated only with her Bridegroom, saying that Scripture: “As I am to my beloved, my beloved is to me.” (Cant 2:16) And if discussions were smoky and dark, she fled them, bringing herself together with the inner treasuries of her soul; where exhortations were shining and helpful, she directed all of her own mind toward the reception of what was said. she had a love for fasting in which no one of those around her was her equal. She believed that fasting was the protection and foundation of other things. And if she ever had to eat outside of the accustomed time, she experienced the opposite thing from those who eat. For her face was a pallor, and the weight of her body collapsed; for when one is disgusted by an action, the action itself is changed. For as the beginning lays things out, so in general the things that depend on it follow from it. For while to those for whom food becomes and bears pleasure, the weight of the- body flourishes; to those for whom the opposite occurs, their flesh is undernourished and slight. The sickly witness to my word. 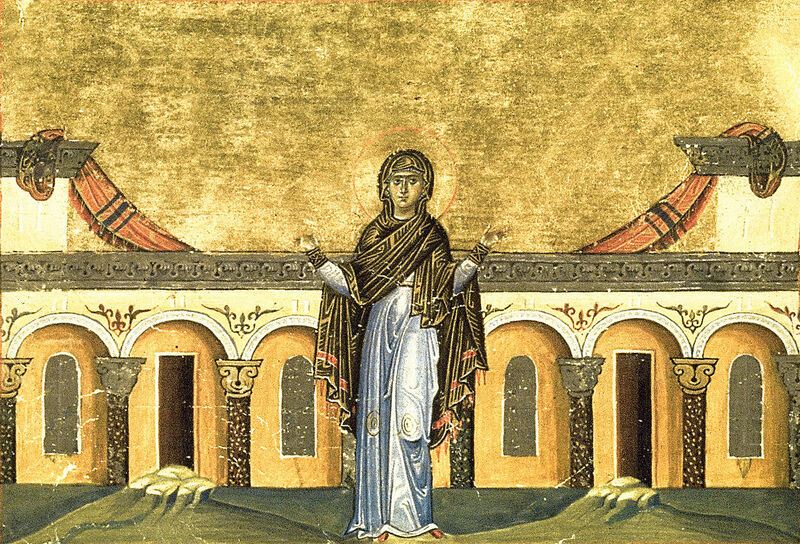 Certainly the blessed one herself testing herself to cure her body [noseleuein to soma], brought blossom to her soul; for she acted according to the apostle who said: 'For as much as our outer human being perishes," he says, "'the inner human being is renewed.” Therefore she struggled bravely while escaping the notice of many. Being trained sufficiently in sufferings; and having been led to the very height of the stadium, she made progress in virtues. How many then approached this divine mystery unprepared and inadvisedly, and fell short of the object of their desire, not having considered everything ahead of time? Just as people who are about to make a journey first give thought to their provisions, just so she, having prepared herself with provisions-with long sufferings-she made the journey toward heavenly things without restraint. For, having put away beforehand the things for the completion of the house, she made for herself the most secure tower. For having distributed her property to the poor, and having renounced anger and memory of past injuries, and expelled envy and love of fame, she built up her house upon the rock from which the tower was splendid and the house free from storms. What more do I say? For from the beginning she surpassed those who were in the habit of the solitary life. For just as the most naturally suited of children, still in the process of learning their letters, compete with those who are older in the presence of the teachers; just so, she, fervent in spirit, outran the rest. We are not able to speak of her active and ascetic life, because she did not allow anyone to become an observer of this. For she did not want the people who were with her to be heralds of her manly deeds. For she did not give as much thought to good deeds as to guarding the secret of them. For she bore in her heart that word of the Lord: “If your right hand does something, do not let your left hand know it.” Thus, escaping notice, she performed the acts fitting to her profession (of the religious life). Thus she observed carefully the first movements of her soul, not allowing herself to be dragged down by them together with bodily desires. Just like an unpruned tree she trimmed the offshoots of fruitless branches; for she set aside through fasting and prayer the thorny buds of thought. And if she progressed in one or another of these in some small way, she addressed various torments of them, mortifying the body by means of all sorts of sufferings. She was not satisfied by mere abstinence from bread, but she also contented herself with little water. When the battle of the enemy was waged against her, she called emphatically upon her Master for aid by means of prayer; for she was not satisfied by a simple ascetic practice to extinguish the assault of the lion. And from her supplication the Lord was there, and the enemy fled. But often the hated one endured the battle, and the Lord did not ward off the murderer, in order to strengthen the exercise of the virtuous soul. Therefore, by means of these things the surviving enemy was defeated, and she lightened her most piercing ascetic practice. She did this so that the members of her body might not be suddenly weakened; for this was the positive proof of defeat. She took care of her body when her own boat moved toward calm. Therefore the blessed one having seen accurately the little wave present in life, and foreseeing the surgings of the spirit, she was carefully steering her own ship toward devotion to God. For she anchored without disturbance in the saving harbor, placing herself in the most steadfast anchor, faith in God. Thus having withdrawn by herself, she became perfect in good works. As time went on, and when her virtue blossomed, the sweet fragrance of her most glorious sufferings passed on to many. “For nothing”, it says, “hidden will not be made manifest.” For God knows how to proclaim by himself those who love him toward the correcting of those who hear. Then therefore some began to enter with a desire for that which is better and to make entreaties for their own edification. For they approached the ways she led her life, wishing to be helped and according to the accustomed formula, they asked her: “In what way is it necessary (to be) to be saved?” But she, having sighed heavily and let flow a multitude of tears, withdrew into herself, and as if she had made an answer by means of the tears, she practiced a second silence. But the ones who were with her compelled her to speak of the mighty works of God. For the ones who admired her were amazed by the singular sight. And again they exhorted her to speak loud and clear. And the blessed one, having been compelled for such a long time, after sufficient time, and after a great silence, spoke in a humble voice the scriptural words. It was a divine symposium for those present. For they were made merry from the chalices of wisdom. The blessed Syncletike was to them like the pouring out of divine drink and liquid. Each one of them received whatever she wanted. The ones who were gathered rejoiced greatly and robustly at these words, and again they persisted in not having taken their fill of good things. The good-hating devil, not bearing such abundance of good things, wasted away, and devised in himself so that he was able to confuse the origin of good things. And further he asks the oldest virgin to the final struggle (agony); and he took revenge against her with hatred, not caring to begin the blows externally, but grasping her internal organs, he deeply assigned to her bodily suffering, so that she became inconsolable from human succour. He first smites the most necessary organ in life, the lung, and through illnesses that bring ruin, bit by bit he fastens his malignancy (cancer). many blows and much time his own severity. For breaking up the lung into small pieces by means of spittle that brought them up, he cast it out. Unceasing fevers were present, consuming her body after the manner of a file. Again seeing her confident affirmations against him, the hater of good was vexed. And seeing her destruction of his tyranny, he devised another type of evil; and he struck her speech organ, to cut off the spoken word, thinking that by this act he would starve of the divine words those who were with her. But if he deprived the hearing of use, he bestowed an advantage even greater. For perceiving with their eyes the sufferings, they strengthened further the will. For the wounds of the body of that one [Syncletike] cured the stricken souls. And one could see the caution and healing of those who saw the greatness of soul and patient endurance of the blessed one. Therefore the enemy made this excuse for this blow against her: for having caused pain in one tooth, he made her gums putrid in like manner. And the bone fell out; the spreading passed into the whole jaw, and became decay of the body pressing on the neighboring parts; and in forty days the bone was worm-eaten. And within the space of two months' time, there was a hole. The surrounding spaces were all becoming black. And the bone itself was corrupted, and little by little wasted away; putrefaction and the heaviest stench governed her whole body so that the ones who served her suffered more than she did. Most of the time they withdrew, not bearing the inhuman odor; but when need called, the multitude approached, kindling incense, and again withdrew because of the inhuman stench. The blessed one clearly saw the adversary, and did not at all agree to have human aid brought to her, demonstrating again in this her own virility. But those who came with her exhorted her to anoint the places with unguent for their own weakness, but she was not persuaded. For she believed that through external assistance they would destroy the glorious contest. And the ones with her sent for a doctor, so, if he could, he would try to bring about a cure. But again she did not allow him to be brought, saying: “Why do you thwart this good battle? Why do you seek what is apparent, ignorant of what is hidden? Why do you concern yourself with what is, not contemplating the one who made it?” And the doctor, who was present, said to her: “We do not bring a remedy for the sake of cure or consolation, but in order to bury the alienated and dead part of the body according to custom, so that those who are here will not be corrupted at the same time. For they bring such to the dead, and we do it now; I put on aloe at the same time as myrrh and myrtle wet with wine ....” And she accepted receiving his advice, feeling mercy rather for those who were with her; for from this the excessive stench was destroyed. Who did not shudder, seeing such a great plague? Who was not helped, seeing the patient endurance of the blessed one, and forming a notion in her of the fall of the enemy? For seeking a feast, he became food. For she was offered as bait through the snare by the weakness of the body; seeing a woman, he looked down on her, for he did not know of her virile mind. He observed ailing members, for he was blind and not able to observe her strongest spirit. Therefore for three months she competed in this contest. Her whole body was strengthened by divine power. The completion toward her resting place was made less. Therefore she was without nourishment; for how was she able to take meals, when she was ruled by such putrefaction and stench? Even sleep was separated from her, cut off by her sufferings. When the end of victory and the crown were near her, and she saw visions and the power of angels, and exhortations of holy virgins to the ascension, and being illuminated by ineffable light, and the land of paradise. And with the vision of these, she became as if one herself, proclaimed to those with her to bear nobly, and not to esteem the present lightly. She said to them, “In three days I will depart from the body .... Not only this, but she revealed even the hour of her departure from there. And when the hour was complete, the blessed Syncletike went to the Lord, receiving the kingdom of heaven, the prize for her struggles for him. In glory and grace of our Lord Jesus Christ, with the Father as well as the all-holy Spirit forever and ever. Amen. - "In the beginning there is struggle and a lot of work for those who come near to God. But after that there is indescribable joy. It is just like building a fire: at first it is smoky and your eyes water, but later you get the desired result. Thus we ought to light the divine fire in ourselves with tears and effort." - "Those who put out to sea at first sailed with a favorable wind; then the sails spread, but later the wind becomes adverse. Then the ship is tossed by the waves and is no longer controlled by the rudder. But when in a little while there is calm, and the tempest dies down, then the ship sails on again. So it is with us, when we are driven by the spirits who are against us; we hold to the cross as our sail and so we can set a safe course." - "There is an asceticism which is determined by the enemy and his disciples practice it. So how are we to distinguish between the divine and royal asceticism and the demonic tyranny? Clearly through its quality of balance." - "It is dangerous for anyone to teach who has not first been trained in the practical life. For if someone who owns a ruined house receives guests there, he does them harm because of the dilapidation of his dwelling. It is the same in the case of someone who has not first built an interior dwelling; he causes loss to those who come. By words one may convert them to salvation, but by evil behavior, one injures them." - "I think that for those living in community obedience is a greater virtue than chastity, however perfect. Chastity carries within it the danger of pride, but obedience has within it the promise of humility." - Someone asked Amma Syncletike of blessed memory, "Is absolute poverty perfect goodness?" She replied, "It is a great good for those capable of it; even those who are not capable of it find rest for their souls in it though it causes them anxiety. As tough cloth is laundered pure white by stretched and trampled underfoot, so a tough soul is stretched by freely accepting poverty." - "Choose the meekness of Moses and you will find your heart which is a rock changed into a spring of water." - "Just as a treasure that is exposed loses its value, so a virtue which is known vanishes; just as wax melts when it is near fire, so the soul is destroyed by praise and loses all the results of its labor." - "Just as one cannot build a ship unless one has some nails, so it is impossible to be saved without humility." In thee the image was preserved with exactness, O Mother; for taking up thy cross, thou didst follow Christ, and by thy deeds thou didst teach us to overlook the flesh, for it passeth away, but to attend to the soul since it is immortal. Wherefore, O venerable Syncletike, thy spirit rejoiceth with the Angels. 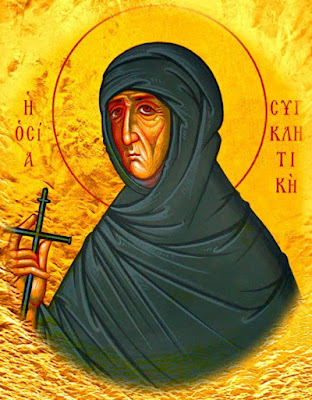 O divine Syncletike, our venerable God-bearing Mother, thou didst shine forth as a lamp bright with unquenchable virtues, laying bare the dark devices of the deceiver; and thy light guided a multitude of wise virgins to the heav'nly bridal chambers; together with them, pray that we all may be saved.